(Vancouver) The BC Lions Football Club today announced it has acquired international defensive lineman Shawn Lemon from the Toronto Argonauts in exchange for a player on the club's negotiation list. Lemon (6’2”, 251) has appeared in all five games with the Argos in 2018 registering five defensive tackles, one quarterback sack and one forced fumble. “Shawn is one of the premier pass rushers in the CFL and he will be a great addition to our defensive line.” said GM Ed Hervey. “Winning the battle at the line of scrimmage is critical to our success and acquiring Shawn at this point in the season gives us a lot of options moving forward." Lemon has a pair of Grey Cup rings sitting in his trophy cabinet, earning the first as a member of the Stampeders in 2014 and the second with the Argos in 2017. 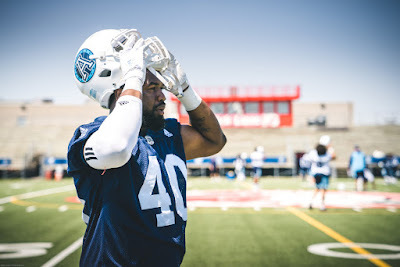 The University of Akron alum also earned an East Division All-Star nod with Toronto in 2016 after posting a career-high 14 sacks across 16 games. ‘The Lemonator’ and the rest of the Lions are currently on a bye-week, but the club will return to the practice field on Saturday in preparation for their road date with the Calgary Stampeders on Saturday, August 4. The next Lions' home game is on Thursday, August 9 versus the Edmonton Eskimos presented by Nissan. Kids tickets to all Lions games are just $10 and seats in the Beach Part Zone are just $20. Click here for more information on single game tickets.